In this series of tutorials we'll practice using the states, layers, and triggers that we discussed earlier. We’ll assume this is a customer call center interaction where a customer calls to report an issue. The employee has to make a decision. One choice will be positive and the other will be negative. The practice slide already has some content in it. There's a customer and a situation that requires a decision. We’ll add an employee and create a simple interaction where we provide feedback by changing the character’s expression and showing new slide layers. Here's the download file for you to follow along. Open the starting scenario file from the practice folder. Go to the Insert tab. Insert a new character to be your call center employee. Select an expression and the headset pose. Crop the desk out of the image. Now we’ll add a feedback button that will change the state of the two characters when clicked. Insert a button. This we’ll title Choice 1. In this scenario, choice 1 is not the best choice and the customer will become angry. 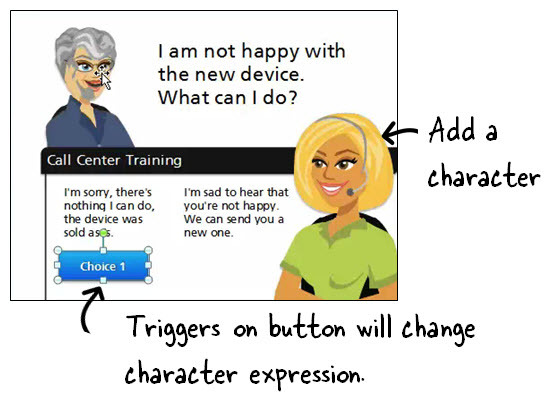 So let’s add a trigger to the button that changes the state of the customer to angry. Remember, triggers are always: What should happen and when should it happen? In this case we want to change the state of the customer to angry when the button is clicked. On the Triggers panel, select the button’s trigger. 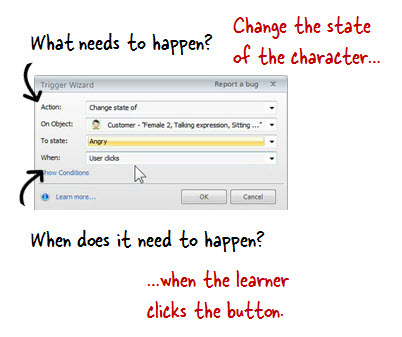 Then set the action to change the state on the customer to angry (a built-in expression) when the button is clicked. You built your first simple interaction! Now let’s add a trigger to change the call center employee’s expression, too. Select the Choice 1 button and then add a new trigger from the triggers panel. Change the state of the call center employee to surprised. And then preview. There you have it. In just a few simple steps you built a quick elearning interaction. We’re going to build on that in the next tutorial. Make sure to save the changes on the slide so we can use them for the next tutorial. In the previous tutorial we added feedback using state changes and triggers. In this tutorial we’ll add feedback to the interactive scenario with Slide Layers. Let’s review what we’ve done so far. We created a Choice 1 button that when clicked changes the expressions of the customer and employee. This is a great way to provide some visual feedback in your courses. Now we’re going to add a feedback Slide Layer to the button. And then we’ll add another button for Choice 2. In the Layers panel, add a slide layer and title it “Choice 1.” Notice how the base slide is viewable on the slide layer? This makes it easy to align your content. We’re going to add a customer response in the same place where we have the original customer statement. Let’s hide the customer comment so it’s not visible when we show this layer. On the timeline you’ll see the Base Layer Objects. Click on the arrow to expand the timeline. Then click to the eye icon to hide the text box on the base layer. Add a text box to the slide layer for the customer response. Add some text to show the customer is not happy. Click on the base layer. Now let’s add a trigger to the Choice 1 button that will show the Choice 1 layer. Select the Choice 1 button. Add a trigger to "show the layer Choice 1 when clicked". Preview the slide. You should see the character state changes and the text from the Choice 1 layer. Create a new slide layer. Now we’ll duplicate the layer and button for our second choice. Select the Choice 1 layer and then duplicate it by clicking the duplicate layer button. Title the new layer “Choice 2” and then change the text in it to make it positive feedback. Copy the Choice 1 button. Hold SHIFT+CTRL and drag the button to the right. Copying the button also copies the triggers. This means you don’t have to do much to change the interaction. On the Choice 2 button triggers, change the link from Angry to Happy for the Customer. Change the link from Worried to Happy for the Employee. And change the layer link from Choice 1 to Choice 2. In just a few clicks you created an interactive decision-making scenario using Storyline’s States, Layers, and Triggers. And that’s the essence of creating interactive content in Storyline. Of course, there’s a lot more that you can do but at this point it's just a matter of practicing the basics and then building from there. 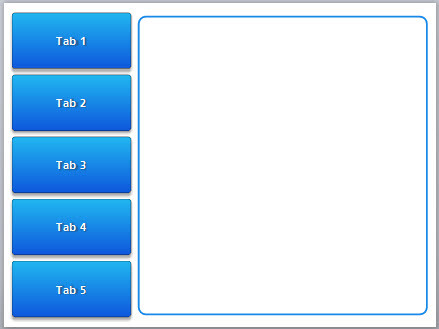 Here’s a good practice exercise: how would you build a tabs interaction like the image below? Each tab should reveal a different layer. Give it a try. In the next tutorial, we’ll take a quick look at the interactive markers and learn how easy it is to add them to your slides.